You can keep your sliced "wonder." Homemade flour tortillas are the BEST bread! Seriously, what isn't there to love about a nice warm fluffy buttery tortilla? Well, my friend, Joanna, a native New Yorker, told me the same thing when we first started sharing our apartment together years ago. Until then, all she was familiar with were the dry, factory produced "Mission" brand tortillas. She really wasn't a fan. So, uh, yeah, "Yuck!" They crack, they're dry, they have no "soul." Tortillas are the heart and soul of Mexican food. If you haven't experienced a homemade, hot off the griddle flour or corn tortilla, you are missing out on a tasty treat! Growing up, we had tortillas with virtually every meal. In fact, my very earliest culinary memory is making tortillas with Mom. When we were all really young, she made them every day: a big stack of several dozen at a time! I remember her pulling a chair up to the counter next to her for me to stand on. She'd take a can of vegetables, remove the label, flour it up and that would be MY rolling pin. I loved it! And my little mound of dough would be so over-worked and darkly stained from my little 4 year old hands dropping the can, working in too much flour from starting and restarting my attempt at rolling it out trying to get mine as close to as round and beautiful of a shape as Mama's tortillas were. I was always so excited to see her lovingly lift it off the counter, pat off the extra flour and place it on the hot griddle while teaching me what to look for: "Just as it starts to bubble, we carefully turn it, see? Then we use a clean towel and we press and magic! It starts to puff up. We turn it once more and then off into an awaiting tortilla warmer." Of course, at this point, I would stop as she buttered up my creation, sat me back on the chair and I'd munch on MY tortilla as she went back to making them for that evening's meal. And if I got back to helping and creating more, my poor parents were forced to eat my overworked tough tortillas. Ah, parents. What they won't do to encourage us! Most definitely the "bread" of Mexico, almost any food can be wrapped up in a warm (or cold) tortilla! We use them in place of forks and sometimes plates, we roll them up for our version of the portable sandwich (taquitos, burritos, etc. ), we tear 'em up, we sop up mole, we fry 'em, we dust them with cinnamon and suger, we layer 'em up for "Mexican" lasagna, we love 'em and we eat 'em here, there, and every where. In our home, we even had what we coined "Mexican Hot Dogs." We'd take our weiner, put it on a fork, lay it directly over the gas burner, cook it on all sides (slightly charred of course... our version of "grill marks!") then place it in a warm corn tortilla with French's mustard and chopped onions and cilantro. Yum! The perfect dog! Fast forward to my first year away at college. Art supplies were so expensive! I lived on basics: peanut butter, eggs, beans and yup, homemade tortillas! 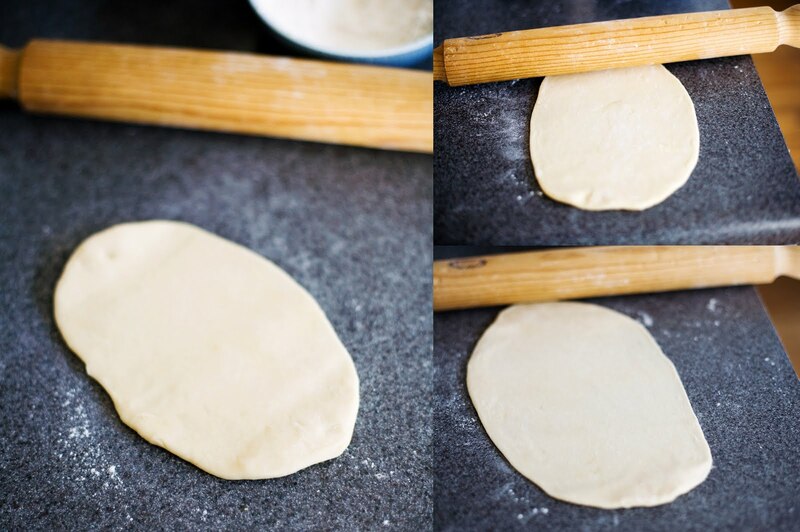 I remember writing mom and asking for her recipe because even though I always helped make them, she almost always prepared the masa (Spanish for dough). And try as I might, I just couldn't get them like hers. For the fat, mom likes using vegetable oil. She doesn't measure. It's all by "feel." Even now, all these attempts later, I can't quite duplicate her results. But that hasn't stopped me from trying to master them. After years of experimenting, I've settled on using cold butter in place of the vegetable oil and violà! I've duplicated Mom's end result. And Joanna? I'm happy to say that after the first time she tried my flour tortillas, I successfully converted her into a true tortilla lover! Super simple! Here's all you'll need: Flour, cold unsalted butter, salt, baking powder, water. That's it. 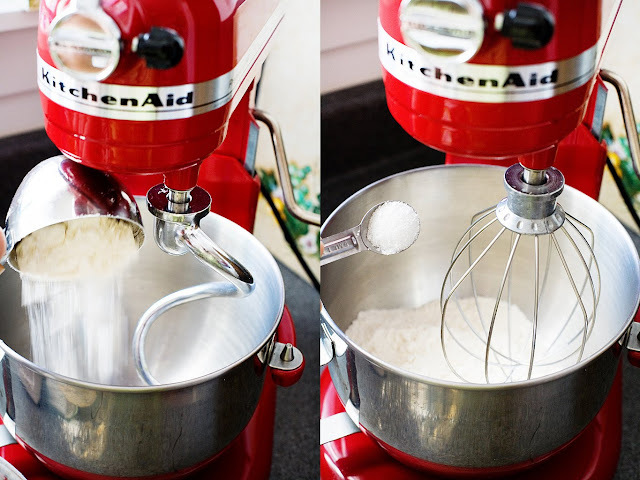 Now a note on the mixer: before I got my lovely Kitchenaid, I, like my mother and her mother before her, always used our hands from beginning to end. I use my mixer whenever I can in an attempt to justify the ridiculous amount I paid for it. That said, I have to admit, I do rather like the Kitchenaid helping out with the cutting of the shortening and the start of the kneading process. If you don't have one, by all means, just use a big bowl and the best tools we have as cooks: our hands! Measure out and add the flour to your bowl. Add the salt. 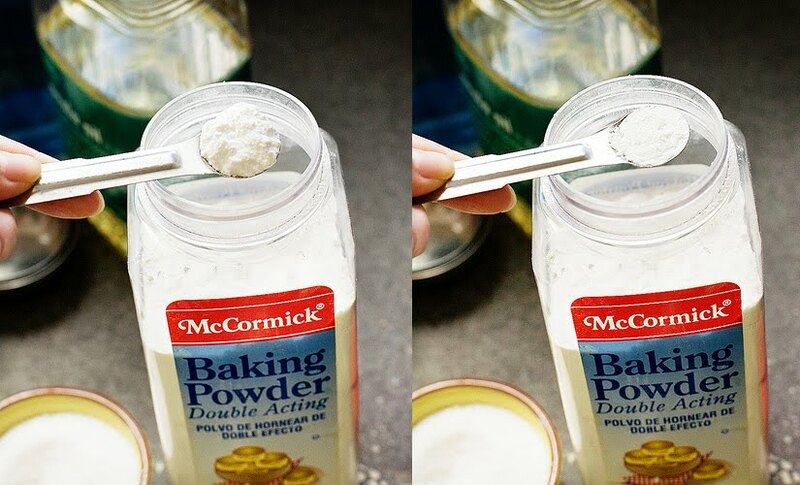 Level off the baking powder and add it. Next, you'll need cold, straight from the refrigerator butter cut into pieces. Drop them into the dry ingredients and with a whisk or paddle attachment (or your fingers if you're doing this by hand), set the machine to low first and start cutting the butter into the dough. Up the speed to medium. Turn the machine off. 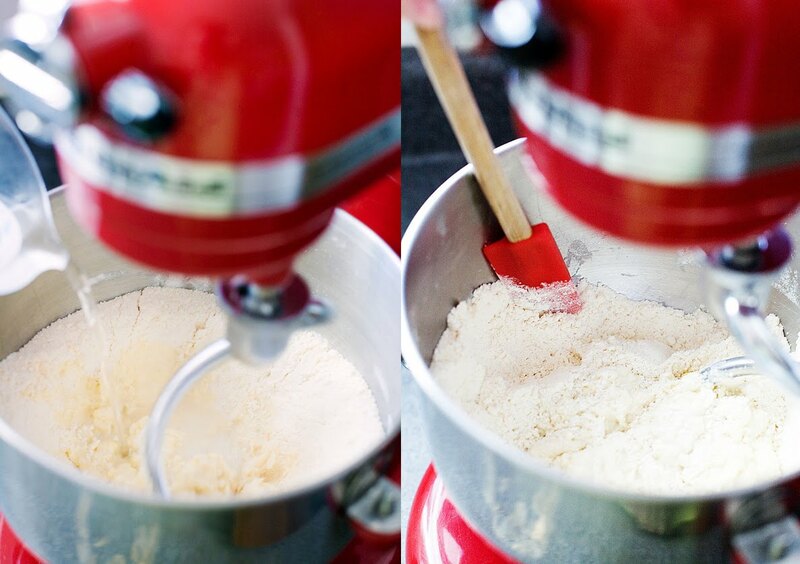 Use your fingers to break up any of the bigger chunks that were missed by the mixer. The masa should start to look like this. Place the dough hook on the machine. Turn the machine on low. Slowly add the hot water. Turn up the speed to medium. The dough will begin to form. Turn off the machine and use a spatula to scrape down the sides. Turn the machine back on and continue to knead. Once most of the flour is incorporated and the dough has started to hold together, remove the hook. Time to use your hands. Knead the dough, picking up and working in any of the flour left on the bottom and sides of the bowl. Once all the crumbs are incorporated, knead the dough about 3-4 minutes creating a smooth ball of dough. Place the dough back into the bowl and cover with a few damp paper towels. Then cover with a clean warm dish cloth and let the dough rest for at least 15 minutes. While the dough is resting, start heating up the griddle. Place a 1/4 cp or so of flour into a small shallow prep bowl. Ready the rolling pin and make sure your work surface is clean. Pick up the dough and pinch off a smaller ball from the bigger ball of dough. Roll between the palm of your hands to get a nice smooth ball of dough. Continue till all the dough has been pinched into smaller balls. Dip a ball of dough into a shallow prep bowl filled with flour. Smash the ball into a disk and then using your thumbs, continue to work the dough turning it clockwise until a round disk about 1/2" thick forms letting the flour spill off onto your work surface. Add more flour to the work surface. Place the hand-formed disk onto the floured up work surface. Disk should be aobut 1/4" thick. Using a little bit of pressure on a rolling pin, roll up, pick the pin up and off, then starting at the top, roll back down. Repeat a few times creating an elongated oval of dough. Pick up the dough, flip and lay back down in a third to a quarter turn. Roll the pin again stretching and elongating the dough. It may start to look more boxy than oval but keep repeating the flipping and quarter turn adjusting the turning so that you eventually make a nice round shape. Work the dough down to about 1/16 to 1/8" thick being careful not to be too rough as the thinner the tortilla gets, the more likely the dough may begin to "tear"... If you do get a tear, simply pinch the dough back together with your fingers. Carefully lift the tortilla off the work surface and lay out onto your griddle. Watch them...now flip the tortilla over. Using a towel, dab the tortilla while applying a little bit of pressure. This will force the heat to form bigger pockets of air within the tortilla. Ever had a tortilla that cracks like a cracker or is so dense that it feels gummy in your mouth? This is the step that was missed in the cooking process. It's these "pockets" that create the yummy fluffy lightness of a well made tortilla. Flip once more and the tortilla will start to puff up. Look at that baby take off! This is what you're look for. Fluffy warm goodness! Is your mouth watering yet? Mine is. You have a nice fresh stack of homemade tortillas. Add first three ingredients to mixing bowl. Stir to combine. Cut in butter (or slowly add oil, combine). Add the hot water a third of a cup at a time combining well between additions. 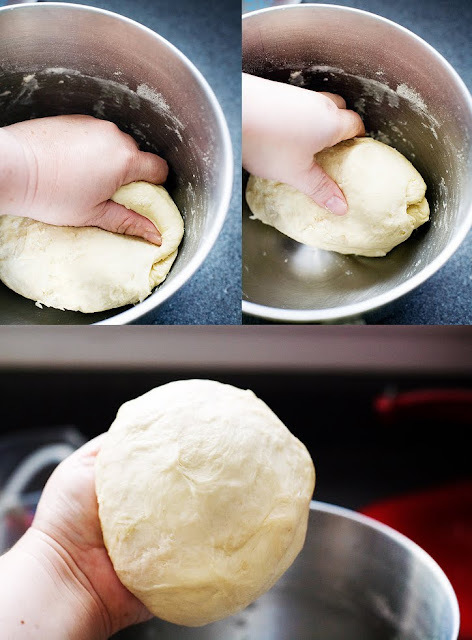 Using your hands, gently knead the dough until it holds together and pulls away from the bowl. Once it holds together, turn out the dough on a lightly floured work surface and knead the dough for a full five minutes. Cover with a clean warm dishtowel and let rest for 15 minutes (Don't skip this step. It's important to let the gluten relax). Heat griddle. While it heats, prepare dough for rolling. Remove towel. Wrapping your hand around the dough, squeeze the dough between your index finger and thumb, pinching away dough about the size of a large shelled walnut. Continue until you have about 18 - 24 small balls of dough returning them to the bowl as you go. Keep the pre-formed balls covered while rolling to keep them from forming a "skin" and drying out. Place one ball of dough into a shallow bowl of flour. 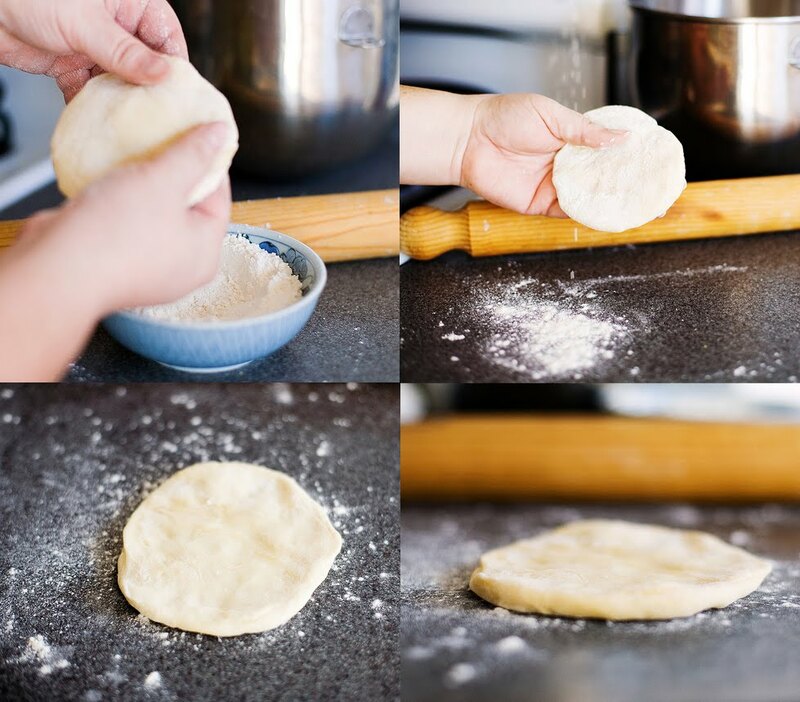 Holding the dough over the work surface, using your thumbs form a disk turning the dough clockwise while pinching in order to keep it round. 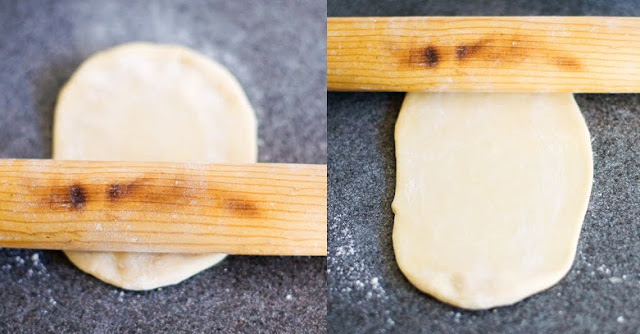 Once it's about 1/4" - 3/8" thick, place a little more flour on work surface, lay dough in the middle of it and use a rolling pin up and down a couple of times while applying a little bit of pressure. Dough should be an elongated oval shape. Flip the tortilla turning it a quarter turn. Roll up once, then down. Repeat then flip and turn and roll and repeat until the shape is round and nearly paper thin (I can see the counter top pattern through the tortilla when it's thin enough). As it gets thinner, take care not to be too rough as the thinner the dough gets, the more easily it will "tear." If it tears, use your fingers to pinch the dough back together. Place the tortilla onto a hot griddle (cast iron is best). Dough will bubble up like a pancake does. After 20 seconds, carefully flip the tortilla. Using a clean towel, dab the tortilla applying a good amount of pressure to force hot air pockets to form. Flip once more and allow to puff up. You want it light browned. Total cooking time is about 45 seconds to one minute. Remove tortilla and place in a cloth covered bowl or tortilla warmer. Continue with the rest of the dough. Serve immediately. Store tortillas up to three days (if they last that long!) in a sealed gallon sized Ziplock in the refrigerator. To reheat, heat griddle and warm tortillas, flipping as needed until warm enough for your taste. Alternately, wrap tortillas in a dampened paper towel and warm in a microwave on high for 20-30 seconds for one tortilla, longer for multiples. My mouth is watering nice job! I love when they fluff up on the grill, perfect. You better believe you converted me into a tortilla lover!! What a gorgeous post Ani-as always. You are my hero of the day! This is fantastic!!! I shall try soon. I LOVE fresh tortillas, these look great! I like the way you make this recipe! I am drooling over the photos! @masa assasin: Thank you! I love when they puff up too! @Just Jenn: Thank you Jenn! I love 'em too... hot off the grill! @dining room tables: Welcome! And success! They made you drool! I've been looking for flour tortilla recipes that melt in your mouth, Looking forward to trying this recipe out. Thanks for sharing and OMG! lovely photos.